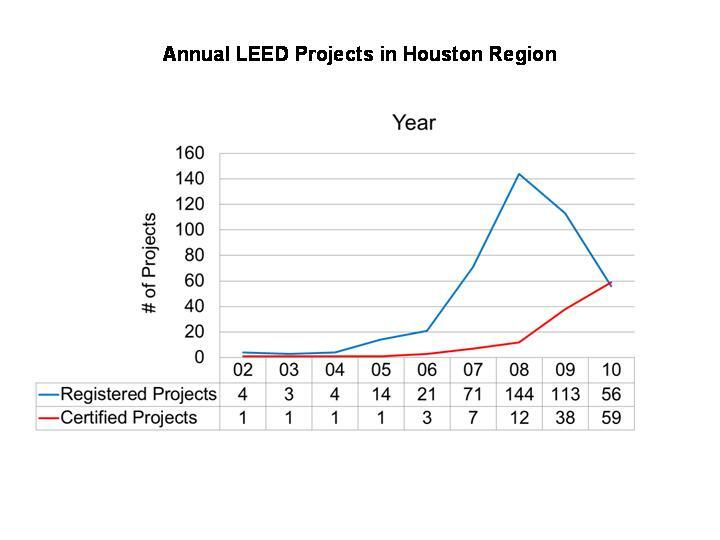 For the first time ever, the number of Houston LEED projects Certified exceeded the number of projects Registered for LEED. 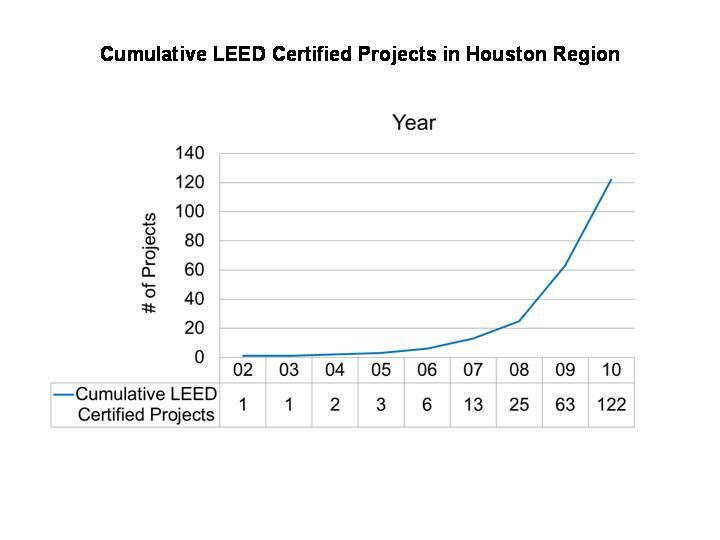 In 2010, the Houston region had 59 projects acheive LEED certification, a 55% increase over 2009 and a continuation of the exponential rise of Certified projects. On the other hand, only 56 projects were registered, a 50% drop from 2009 and a whopping 71% drop from the 2008 high of 144 projects registered. 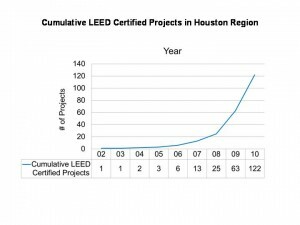 Annual Certified and Registered LEED projects for Houston area. 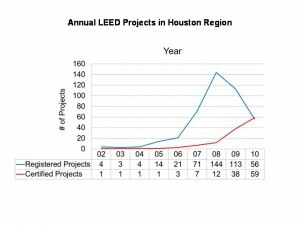 The Houston region has a cummulative total of 122 Certified Projects and 424 Registered projects at the end of 2010. New Construction registrations dropped 50% last year, while Core and Shell registrations almost went non-existent in 2009, dropping from 29 in 2008 to 3 in 2009, a 90% drop. 2010 once again had only 3 Core and Shell registrations, showing the continued weakness in the speculative commercial market. The recession has greatly reduced the number of new buildings, so there is little surpise in that drop. 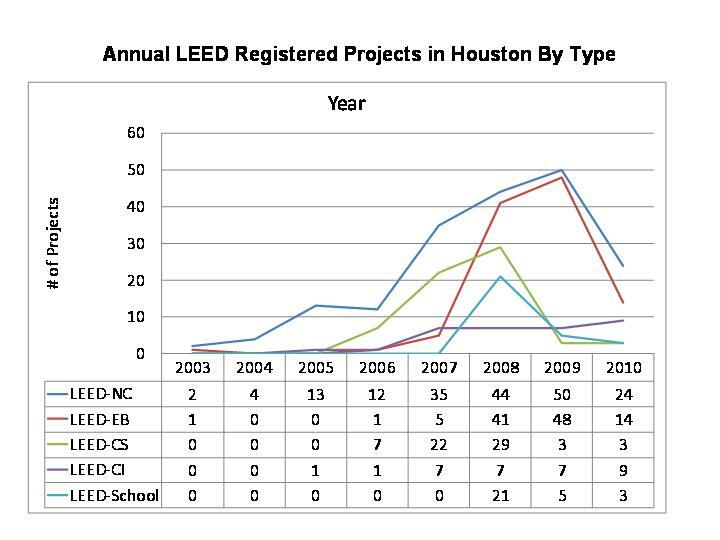 But, surprisingly, LEED-Existing Building registrations dropped by 71%. Does this indicate that EB has played out? 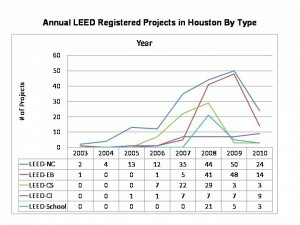 There are 110 total LEED-EB projects registered in the Houston region. 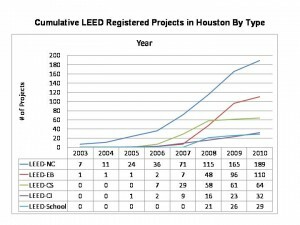 This is reaching par with the number of Energy Star properties in the Houston region. That’s disturbing that both of these programs seem to have reached a plateau. With local and federal incentives, especially the City of Houston’s new Energy Efficiency and Conservation Block Grant that targets older and smaller properties, hopefully more property owners will realize the wisdom of efficiency investments. Until 2010, we could expect registrations to outpace certifications by a 2 to 1 ratio. That would reflect the # of projects that don’t happen, give up their LEED pursuit, are delayed, change of registration types, etc. What does the future hold? I foresee certifications staying the same or increasing only slightly and prehaps registrations picking up slightly. Certifications have approximately doubled each year since 2006, but I don’t think that pace can be maintained until new construction increases and the practical field of Existing Building stock can be expanded. 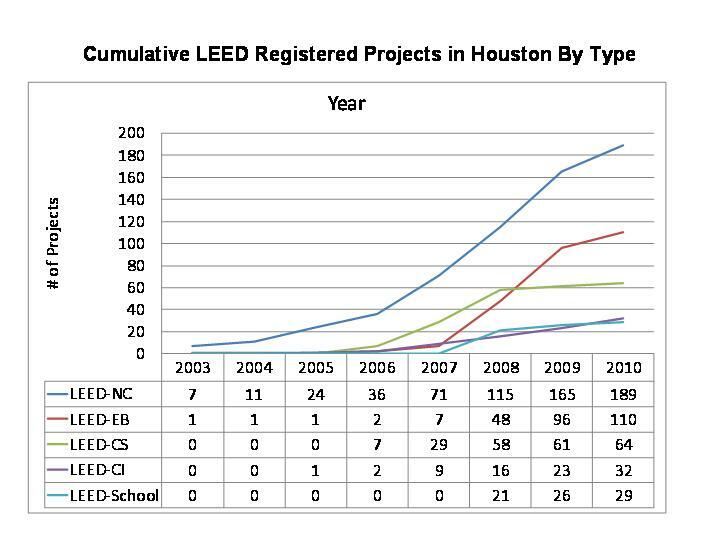 Footnotes: These statsistics do NOT include LEED for Homes projects and they do not include confidential projects.